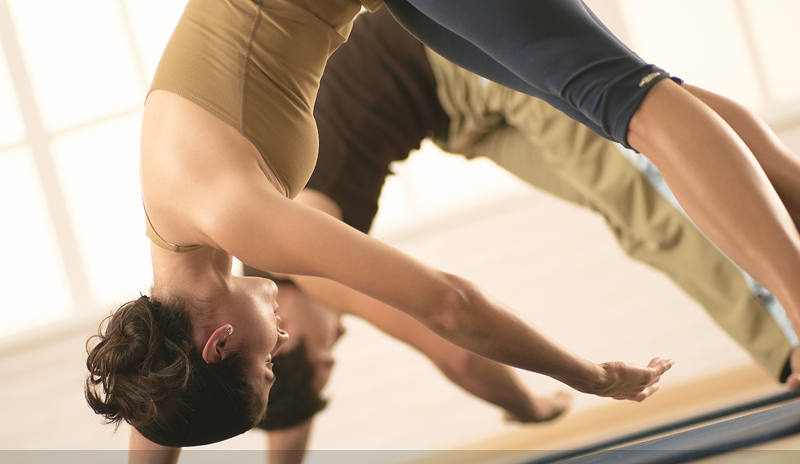 Interestingly, Joseph Pilates studied yoga and is known for having studied the movements in animals. This is apparent in the beautiful movement of the classical Pilates repertoire and the principles he developed. Pilates is a full body workout that focuses on working from the inside out, from the core out to the periphery. This is done by initiating all movements from engaging the abdominal musculature. The exercises emphasise postural muscle strength, stabilising muscles that support the joints, including the spine and the repertoire works on multi-planes of movement for the spine and the whole body. As you get more advanced, more complex movements, more control, and more muscle groups are needed and recruited into a full body workout. Pilates is a mind/body type of exercise as you must use your mind through breath to accomplish control. Ahead of his time, Pilates’ exercises correlated the use of the mind to control the muscles of the body. He accomplished this by focusing on the abdominal muscles and postural muscles in order to balance the body and maintain support the spine. Pilates exercise focuses on awareness of breath and uses breath to connect mind to body. Joseph Pilates immigrated to the US around 1925 where he founded a studio in NYC with his wife Clara, and taught students well into the 1960’s. Since his death new research on sports science and rehabilitation has emerged giving rise to what we call contemporary Pilates. New schools, such as STOTT PILATES®, have preserved the original Pilates exercises while incorporating the most up-to-date research in health and fitness, making it safer and more available to a wider audience. Contemporary Pilates is not the same as popular dynamic Pilates. As we moved into the 201st century, Pilates exercises have been revised and modern principles of sport science and rehabilitation have been integrated to the original method. Pilates exercise is still taught on the mat, reformer, and other pieces of equipment, such as the chair, barrels and Cadillac. Dynamic Pilates in contrast, is about working out on the Pilates reformer. It is actually only taught on the reformer and does not teach the exercises or principles pioneered by Joseph Pilates or contemporary STOTT PILATES®. Dynamic reformer can be taught by anyone who has undergone any weekend course in this style taught by a dynamic studio. Whereas contemporary Pilates requires weeks of training, self teaching, teaching and a theory and practical examination. We at Core Kensington recognise the benefits of Pilates exercise for people of all ages and abilities, including special populations and those recovering from injuries. We teach the Pilates repertoire on all pieces of equipment and progress through levels from essential to intermediate and advanced. Whether you suffer from back pain or are recovering from an injury, our team of experts will help you with your rehabilitation process. Book now and get your first class for only £15.